My 6:30 AM Thursday flight from Halifax was delayed from landing at JFK by marine fog and a cloud ceiling of less than 100 feet. We circled around JFK for over an hour hoping for a break in the cloud cover. We then were forced to divert to Hartford, CT to refuel. All this caused me to miss my connection. The end result was that the plane did not touch down at a rainy Logan Airport in Boston till after 2:00 PM. Doug Koch met me at the airport and we immediately headed north to Newbury where a Barnacle Goose (or possibly 2) has been flocking with Canada Geese since Sunday. Doug called “Bland” Liz Southworth to inform her that we were on our way and she went out to the Artichoke Farm and the reservoir to locate it for us. Liz was on the cell 30 minutes later and reported that she had a brief look at the Barnacle Goose, but by the time we arrived it had waddled over the hill and we were unable to relocate it. Visibility was terrible and we were getting soaked standing in the rain so we decided to give up and start fresh this morning. Things went much better this morning. Liz suggested we begin over at the plane field near the visitor center for Plum Island NWR where it been seen on several occasions yesterday. A birder was already on the scene and gave us the happy news that as we spoke the Barnacle Goose was indeed feeding among a flock of a hundred or so Canada Geese. 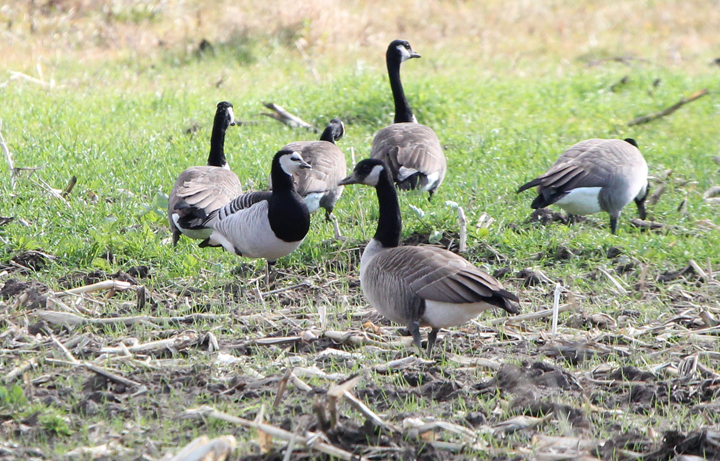 It appears that more and more vagrant geese from Europe are showing up each fall in the Northeast. Lynn Barber had both Barnacle and Pink-footed in 2008 and Bob Ake actually ticked both of those as well as the mega rarity Greylag Goose last fall during his big year. Why the influx of wintering European Geese into our continent? North American Canada Geese populations are increasing and are ranging east farther into Europe in the spring and summer. Dave Currie told me that a Canada Goose that showed up this week in Nova Scotia had been tagged on it’s breeding grounds in Scandinavia! This means that they are mingling more and more with European Geese, not just in Greenland and Iceland, but the British Isles and the European continent as well. This would logically result in more of the odd European geese – Pink-footed, Barnacle or Greylag getting mixed into staging flocks of Canada Geese and ending up on this side of the Atlantic Ocean for the winter. Certainly I’m happy and relieved that this particular Barnacle Goose was so cooperative. Anyways, I’m thrilled to now be sitting at 733 year-birds. 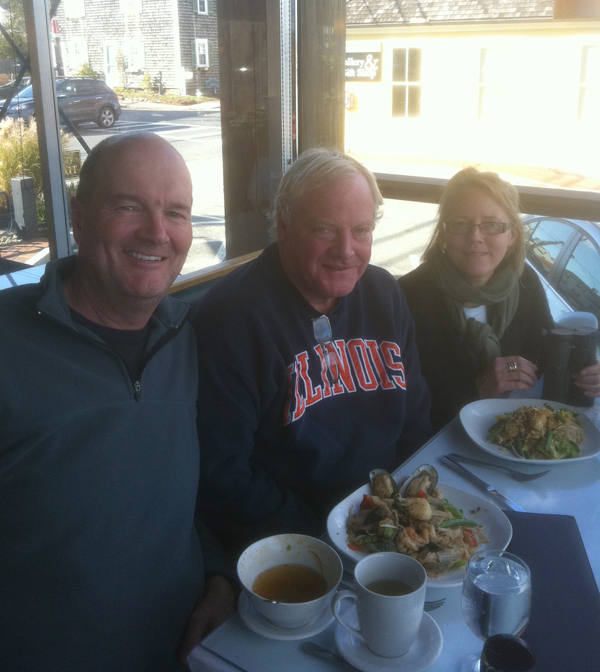 Doug and I both want to thank Liz and Morris for being gracious hosts. But now comes the discouraging news. Saturday’s scheduled pelagic trip out of Hyannis has been cancelled due to strong winds. The pelagic trip has been rescheduled for Sunday Nov 20. That could be problematic for me logistically so close to Thanksgiving. I’m on a plane headed back to Colorado this evening. There are still a few other tricks up my sleeve for Great Skua – just in case. By now this is probably old news: Isaac Helmerick’s Whooper Swans are back on Adak for the winter again. Plus you still need the Whiskered Auklet. It may be time to check in with Isaac again, and his fishermen/boat connection. It has been fun reading about your progress. Another dozen or so species would put you right up there with Sandy Komoto. Good luck and great birding. Awesome John, congrats on the Barnacle and 733! And as Deanna said, thanks for the amazing goose facts, I had no idea.. I was thrilled to be even a tiny part of your Big Year adventure! Now, just a few more birds…. Congrats on another great bird. 49 days and counting till the ball drops and the counting stops. Blast away!! Congratulations on finding the Pink Footed Goose and the Barnacle Goose! I’m shocked that a Canadian Goose traveled so far. I just added the European Starling so now my total is 27. I saw a swan yesterday but wasn’t close enough to identify it. There are three types of swans in Michigan: Trumpter, Mute, and Tundra. I have a Boy Scout outing later today at a wildlife sanctuary and I hope to add to my count. Things are happening at Adak.